Life in the Pitts: Now *this* is an awesome tradition. Matt and I went to the mall our first christmas and bought a handmade penguin ornament. It was the only ornament we had that year. Now each new year we buy another penguin ornament to add to the collection. I'm literally melting at these stories. I love the creativity and the personality, especially taking the wood from the tree itself. That is awesome!! I love those ornaments! Your dad is so sweet! Your dad sounds like the sweetest man ever. Awwww! What a sweet dad and a sweet tradition! From the year that my hubby and I married I have bought personalized ornaments. Started with two white bears with our names... this years has 5 snowmen in a sled bearing our names. LOVE them all! Those ornaments are awesome. I love sentimental ornaments so much more than the pretty decor ones. (we have somewhat of a mixture of both on our tree). That tradition that your Dad started is so sweet! 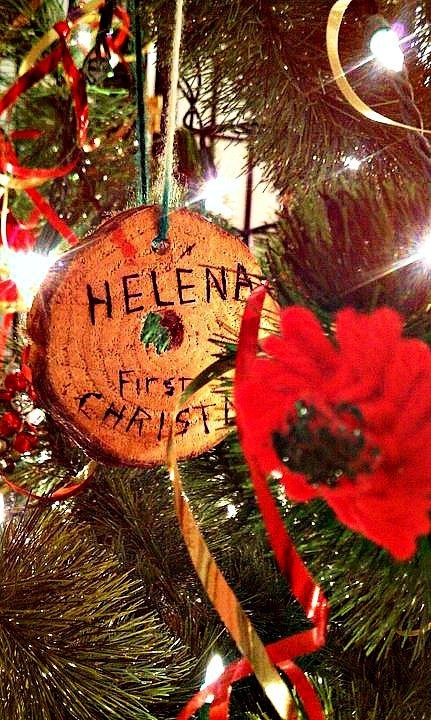 Every year we get a new personalized ornament for Christmas - I love pulling them all out when we decorate our tree, it brings so much more joy and I love reliving all the past Christmas'! you're dad is so awesome! The only ornament I have that isn't just a box one is one we got from NYC. My grandmother, when she was alive, gave all the grandkids a new ornament every year. I have no idea where my box is. It makes me sad! i love, love, love this tradition! how thoughtful... something you will cherish forever, i'm sure. your dad rocks! what a cool thing! What a great tradition. I would love to have ornaments like that! My favorite ornament isn't handmade, but it was the first ornament my husband I bought as a couple. Later that day, he proposed to me (in Frankenmuth, on a carriage ride). I love that ornament because of the memories associated with it. I am so jealous! I wish my parents had thought of something that cool when I was a baby... wish I would have seen this post three years ago when my babies were born. I wonder if I could do it this year, backdate it and fool them? Mean, huh? That is SO sweet...I love that! 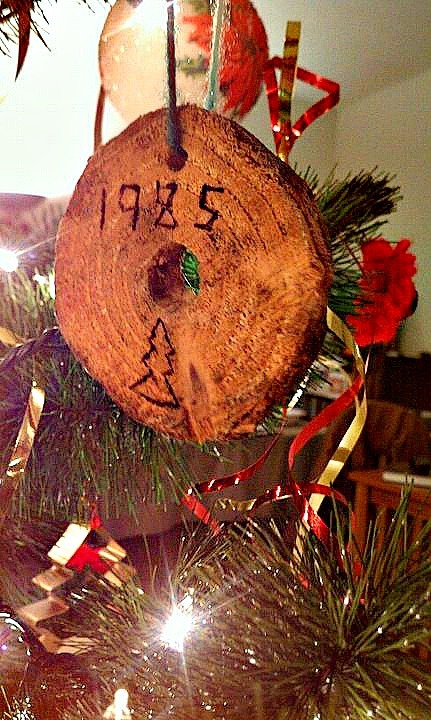 Growing up my grandma would get ornaments for all of her grandchildren each year and write the year on them. I have each and every one of them up until 1999 (she passed in Oct 2000), and I think of her each time I put up one of them. 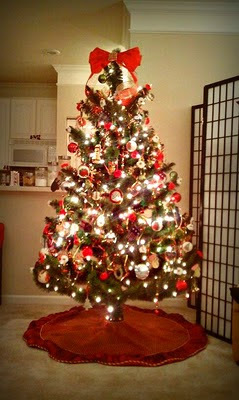 I love your tree and your favorite ornaments! I don't have anything handmade, but I do still have my first ornament. That is so sweet! What an awesome thing for your dad to do. I love it. Our tree would never win any decorating contests but it is so full of memories. We each get a new ornament each Christmas that represents something significant from the year. For example one year we were dirt poor and I made these crocheted snowman gift bags for everyone filled with Christmas baking. I must have crocheted 20 of those snowman bags that year. Anyway, my husband got me a snowman ornament that year. It never fails to make me smile when I look at it. I also have 2 ornaments from my very first Christmas that my grandma made me. I put them up at the top of the tree so the kids can't get near them :) I mean those ornaments are 36 years old, practically antiques lol. Those ornaments are awesome! I'm sure they mean so much more to you than any store bought ornament ever could. 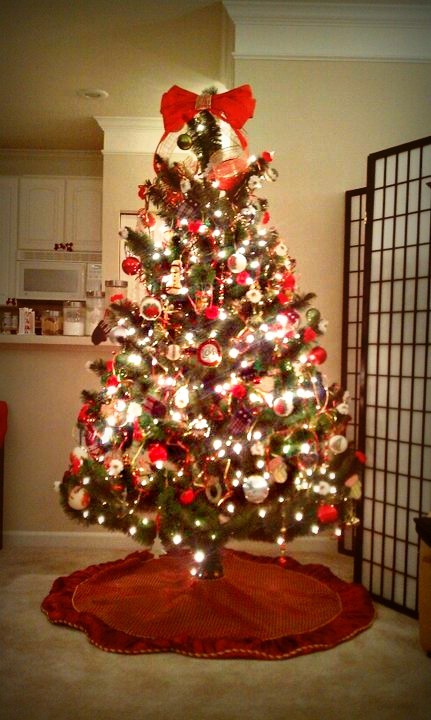 Your tree is gorgeous- you should definitely be proud of it! My favorite part about putting up the tree is remembering all the ornaments. Each one is so special to me. And i LOVE the bow on the top of your tree. Ah, those ornaments are so cool! I love your ornaments. I love personal ones! Your favs are awesome. I am quite jealous actually! I wish I had ornaments to memoralize "firsts". Hmmm...maybe the husband and I will have to copy your fav ornaments once we add on the family! That is an awesome tradition. Your dad is very creative! wow, what a beautiful gift idea! We have our ornament book and every year we buy at least one ornament that is a memory of that year. So every year when I pull ornaments out of the box I sit and remember why this one was special. So one year we went to Florida so I have a bulb with sand and shells in it. Our honeymoon was in FL so we came back with a Santa starfish ornament, etc. This year I went to Chicago twice and we have a Chicago ornament. Every year the kids get their own and I write down why they wanted it and I keep these stories in a little scrapbook. AND when we have people over, it turns into a game- find the ___ ornament and what does it mean? Everyone is trying to figure out what the ornaments mean. :) It's a fun tradition. I love those. What a brilliant idea! My favorite ornaments are the ones my kids have made. That is too cool !!! oh WOW.. that is absolutely beautiful. Reading your post seriously put a smile to my face. Thank you for sharing. What a FABULOUS idea!!! How special and personal-I can see why they are your favorites! Oh how wonderful! I love family traditions! My grandmother was very crafty. By my request she started making and giving me Christmas ornaments when I was a teenager. They are some of my favorites. 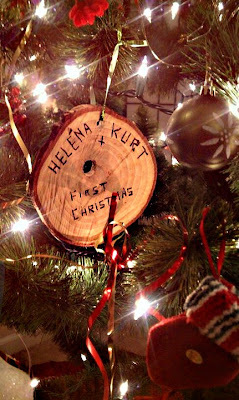 My other favorite ornaments is when my husband and I were first together and wanted some ornaments for our first tree together. We went to a Dollar Store and bought a crazy Santa ornaments with a goat in his beard. I still have no idea why Santa has a goat in his beard. Sweet traditions...and tree :) I'm hosting a "link share" called "Show me your bush". 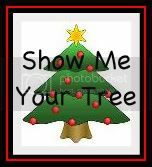 I'd love it if you share your proverbial bush (this tree!) at the party! You tree is GORGEOUS! And oh my gosh what a sweet tradition. I wish I had done that. It's very very special! OMG, this post made me a bit teary-eyed. What a BEAUTIFUL tradition. There is nothing quite like a handmade ornament and thes ones your father carved out of the trees... well, they're magnificent. My favorite ornaments were always the really old ones my mom kept from Germany, most especially the beautiful ballerinas and nutcrackers. They bring back such great memories when I visit my family for the holidays. Love Love Love your ornaments from your Dad. He sounds like such a sweet man. I love having such special ornaments like that that mean so much! That's a tradition I definitely want to continue with my kids. Hopefully by that time we'll have a working vacuum so we can have a real tree without stepping on the needles that fall off. Did you link this up here?? You TOTALLY should! The last ornament almost made me cry. Your Dad sounds too sweet! I loved this post! I tried commenting on this last week but it wouldn't let me for some reason. I absolutely love this tradition that your parents started. It's just so sweet and sentimental. My sister is way allergic to real trees so we never had one growing up, but this makes me wish we had.